00:02 Chris Hannemann: So yeah, we were our own guinea pigs. Thank goodness, we were smart enough to make it reasonably safe. 00:29 Sharon Tewksbury-Bloom: I’m your host, Sharon Tewksbury-Bloom. Our guest today is Chris Hannemann. Chris and I have actually been friends since fifth grade. These days he lives in San Diego and he works as an engineer. 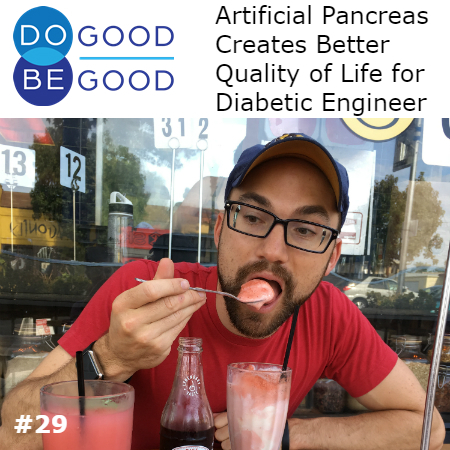 Chris has an amazing story about being one of the first people to create and try an artificial pancreas system in order to have better control of his diabetes. The outcome has been great for him. But it was a really risky move. He was part of something very innovative, experimental. When he was first trying out the system, in fact I remember him calling himself a cyborg. He’ll explain what that means. So let’s get started. 01:13 CH: Age eight, I was diagnosed with Type 1 diabetes, it was unfamiliar to my family and to me, and so that was obviously a pivotal point in my life. Two years later, my father was diagnosed with Type 2 diabetes and a year after that, my younger sister was diagnosed with Type 1 diabetes. All of a sudden, within a three year period, in three out of the five, my family members now had a common disease and we were trying to figure out how to do the day to day management of this. But also it’s a longterm chronic illness with a lot of effects that don’t kick in till later in life. And so you’re sort of always looking at the next minute, the next hour, but also ten years, 50 years down the road. Such an acute risk with diabetes, with Type 1 diabetes, especially of ending up in a bad situation which happened to me a few times when I was a child. 02:03 ST: Do you have an example of one of the times when it wasn’t well regulated? 02:08 CH: Yeah, and you may have been there for this one. I don’t remember now. 02:14 CH: In fifth grade I remember we were watching a movie in class and so all the lights were out. Now I’ll tell you my memory of this is small because I was only sort of present for it. 02:28 CH: The lights probably came on, the movie was stopped and they realized that Chris wasn’t moving. The next thing that I remember I woke up in the nurse’s office with my pants around my ankles and the principal standing over me with a needle in her hand, having injected glucagon, which is like a rescue medication not dissimilar to EpiPen in how it’s administered. And I was coming out of essentially a diabetic coma. 02:54 ST: I have a fuzzy memory but I and maybe someone else were the ones who walked you to the clinic, which doesn’t sound like a good idea. [chuckle] Like, if that is true, that was probably a poor choice on the teacher’s part, for another student to just walk you in a semi-comatose state to the clinic. 03:53 ST: I mean, you said that this really was affecting your whole family with your sister, with your dad, was there anything you did as a family? Were there any points where you had a handle on this together? 04:03 CH: We managed it as a family and I was really impressed when my sister was diagnosed. I checked my own glucose, but my parents gave me my insulin injections for about the first six months before I took over. For my sister, she had seen me do it for three years and she basically started right after she was diagnosed. I was proud of, I guess as proud of as an 11 year old can be of his little sister. 04:25 ST: So then as you got older, at what point did you get involved with the artificial pancreas project? 05:30 CH: Even before I had received this device, I started looking online. I was like, “I’m gonna be getting all this data, I love data, let me see if anyone else has done anything with this data.” That time frame, which was about February 2015, was sort of the nascent days of a movement of a group of loosely related people starting to collaborate on projects where they were trying to see if they could extract the data from these closed medical devices and take advantage to help better treat their diabetes. One of those ways that was just starting up was, “Can we connect the data coming from a continuous glucose monitor, from one company, with an insulin pump from another company. Write a controller and an algorithm that runs on something and communicates with both and then sends commands back to the insulin pump to change how much insulin it delivers?” So a closed loop system. It’s sort of the baseline for what we might call an artificial pancreas. 07:09 CH: That turned out to be Nate Racklyeft. And Nate and I started working on this together, that was in the spring and we started working, working, and by the summer Nate was running a system, and by August I had a system running on me. That was sort of the genesis of it. We were piecing together parts from a variety of different sources, things that people had published online, on GitHub. Things that we had discussed in various chat rooms with folks in Seattle and all across the country and managed to cobble together this system that could start to do what we really wanted it to do. And that was really the beginning for me. 07:42 ST: You were really being your own medical guinea pig, right? 07:46 CH: Yeah, a 100%. These were two FDA approved medical devices, the continuous glucose monitor, and the insulin pump, but we were essentially connecting them together with a Raspberry Pi, a miniature computer with a couple of wireless radios to talk to the various things, some USB cables and then writing an algorithm that ran on the Raspberry Pi and so the algorithm would read all the data from the insulin pump, read all the data from the CGM, make some decisions based on an algorithm that we came up with. And then send a command back to the insulin pump. But yeah, I mean if you kind of lay it out in it’s basis terms, an insulin pump contains a whole lot of lethal medication, so, you overdose on that and you can just straight up die, right? And it carries quite a large volume of it. In a day, I take about 40 units of the insulin that’s in the insulin pump. This insulin pump can hold three hundred units of it. And it could deliver that to you in a matter of minutes. 08:43 CH: So, you want your algorithm to be reasonably safe. The choice that we face was essentially continue on with control that was either suboptimal or required so much of your time that it didn’t allow you to really live your life. Imagine trying to control things overnight, for example. Or give some of it up to this automation system that you’ve built and so you get to put as much, as many safeguards in or as much trust into it as you want and let it do some of that work. So, basically offloading part of your brain space to this. So yeah, we were our own guinea pigs. Thank goodness, we were smart enough to make it reasonably safe. 09:19 ST: I think I remember you calling yourself a cyborg at one point. 09:23 CH: [chuckle] That sounds about right. 09:25 CH: Yeah, that’s it. And especially initially, the controller and everything was so large, that I essentially carried around side case on my back pack and the radios didn’t reach very far, so it had to be fairly close to the insulin pump, and so I’d walk to a restaurant carrying basically like a fanny packs worth of stuff. Yeah, it was a little janky in the beginning. 09:46 ST: What kinda reaction did you get? How many people were you telling you were doing this? 09:50 CH: The question that I would most often get from people when I explain what the system did, was, “Didn’t it already do that? Why wasn’t this a thing that already existed?” And the answer is, well, it was something that was being developed by numerous companies. It was in clinical trials in one form or another, but it was taking such a long time to come to market and it was pretty obvious that we had the technology to do it already. The complication came not necessarily in writing a really good algorithm, it came in, how do we talk to this device that has a proprietary protocol that wasn’t meant to be communicated with by a third party. And that’s where a lot of the concept of it being open source was such a huge gain. Another individual I mentioned, Ben West, had spent literally years decoding the insulin pump communication protocol, he decided to open source that, made it available to the public for no charge. And that enabled other people to latch on and say, “Oh actually, I’ve gotten this data from this other device,” and someone else to come in and say, “Oh now that we have both of these, we can write this algorithm that connects the two.” Nobody did one full stack of that. 10:54 CH: Everyone was building off of everyone else’s shoulders, and the ability to use all this open source software really made it possible. 11:07 ST: I hope you are enjoying Chris’s story. To support this show, please consider buying a Do Good shirt or a sweatshirt. We have them in a few different styles and you can find the details at the website, dogoodbegoodshow.com, Or at the Facebook page, facebook.com/dogoodbegoodshow. Also, what would be really helpful is if you could rate and review our show in your podcast app, and that will help other people find the show. Thank you again so much for your help and for listening. Now back to the conversation. 11:47 CH: In August, 2015, I was probably about the fourth or fifth person in the world to go on one of these do it yourself, artificial pancreas systems. A few different groups spun up. People started finding out about it, started building it up themselves. And you’d get a trickle, maybe one a week, or a couple a month who would find out. There were a lot of steps to do it. It wasn’t particularly well documented. Fast forward a little bit from there, and a couple other systems have started to pop up motivated by individuals in the community who wanted something different. There is a father of a young girl with Type 1 diabetes and he said, “I really want it to be able to talk to my phone.” So he actually came up with a custom circuit design. And it essentially allows your phone over bluetooth to talk to the insulin pump and to do the same things that we were doing before, but now you can start moving things to the phone instead of having to carry around a separate device. In the meantime, the CGM company, Dexcom, made it so that their continuous glucose monitor could also talk directly to the phone. 13:20 CH: So going from about five people in August of 2015, now there’s probably, I’d say between a 1000 and 2000 people worldwide are using some form of a do it yourself artificial pancreas system with various pumps and various CGMs and Android and Apple and it’s kind of gone from here is the one system you can build to, here are a variety of systems that fit your lifestyle and the availability of the devices that you can get. 13:47 ST: What other roles have you played in this project? 13:49 CH: Initially, when I was working with Nate, my background in mechanical engineering came into play and I helped do the control algorithm. Nate was a software developer and an extremely capable one at that. But his background wasn’t so much in the controls and system design side. I helped out with that, and of course on the testing side on myself. The documentation was a big piece. And then also evangelism. So I got to present in a number of conferences, including that fall of 2015, I was invited to talk at a small conference that brought together industry and folks out in the DIY space and doctors and health care professionals to talk about the diabetes technology movement that was going forward. And so, I actually presented about what this was and how it was built and why people were using it. And that’s a very important aspect of it is why are people taking risks. Why are people… Or not seeing this even as a risk? 14:43 CH: And I sort of ended with a plea, which was, “Hey, industry, a lot of our effort is actually spent on just trying to get at the data. You should really consider opening up your data. The device that you make is a really powerful tool, but you should extend that tool by enabling the users to really use it to its fullest extent.” And interestingly enough, at that conference, a gentleman from Dexcom, who made the continuous glucose monitor, came up and chatted with me afterwards and that gentleman eventually hired me to come work at Dexcom to help open up the data coming from the continuous glucose monitor. I see something and I know that that could be controlled better pretty simply if I just could tweak this one thing. So why don’t we go for that? 15:23 CH: Some of the other folks, especially parents with kids with diabetes who were also some of the first on these systems, they were… Had their kids in such tight control that it was impressive. If you look that on paper, you’d say, “Wow, this child is just killing it, right? Their diabetes is great.” But they were doing it at the cost of both the child and the parents’ sanity, for lack of a better word. They were waking up every one or two hours overnight to go and check their glucose. They were rotating shifts with the other parent to be on alarm watch. They were dosing insulin way too frequently, but just in small amounts, and it was a very large burden. And so for some of them, their glucose control didn’t actually improve after going on the system, but they got part of their life back. It wasn’t something that I had appreciated ’cause it wasn’t a place that I was coming from until I got to hear their story. And those decisions, those qualitative or storytelling decisions also have impacts on the engineering. 16:15 CH: They have impacts on everything from the UI and the UX, the display, how do you set alarms to the algorithms themselves. That community aspect really helps build a product around a wide variety of voices. 16:28 ST: I think that’s great that you had this way of connecting with such a wider group of people who were gonna use the system in figuring out what their needs actually were. 16:36 CH: It’s difficult when you have a small number of people who are capable of doing something and a lot of people who want to be able to do it or want to participate. You have to make some decisions about how democratic will the process be if only a small number can commit the time because they have the skills to do it. And that’s a tough trade off for anything. You hope that the end product does in fact represent as many voices as possible, but it doesn’t always end up that way either. 17:05 ST: Have there been any in-person gatherings or events for people who are part of this community? 17:10 CH: Yeah, quite a few actually. It started off with a few of us in San Francisco, and then eventually it’s turned into one or two hackathons a year that are organized around another official meeting. Some people are building systems. Some people are identifying problems and then trying to group together to work on smaller pieces. Some of it’s just community building as well, which is, of course, always great. Now, there are international build parties that happens. If you look on Twitter, you’ll see there’s one in Melbourne, there’s one in London, I think there was one in Spain that I saw recently. And they’ll pop up where people have heard about this but maybe they don’t have one piece of equipment that they need. Someone will organize a group and they’ll all get together in a room for a day and get some pizza and start going at it. The cool thing now is that a lot of healthcare providers have started getting involved. So there’ll be meetups where certified diabetes educators will come, not necessarily because they wanna build a system, although some do run ’em, but just ’cause they want to learn because they are now helping patients who are coming to them with these systems and they want to know exactly what it’s all about, so they can help guide them in other areas. 18:16 ST: Did you ever go back and explain to your endocrinologist what all this was about? 18:20 CH: Oh yeah, it was fairly interesting. The first time I went back because I basically sat down and I was like, “Hey I’m running this on myself. She kind of didn’t initially know how to feel about it, and she ended up putting in my notes. The patient is doing this, and I’ve made them aware that it’s not an FDA approved use of the product. But while she’s typing this, she’s like, “So show me how the algorithm works,” the results speak for themselves. My control has been better every single month since I started on the system. Every time you go to a doctor and you tell them this and then you show them your numbers, they’re like, “Oh whatever you’re doing, keep doing that. 18:55 ST: Does your sister use the system now? 18:57 CH: She does. She waited a while, so at the beginning she didn’t really wanna deal with such a large and weird system that required quite a bit of maintenance. And then once Loop was released, so, I tell her about it and then eventually one Christmas she said, “You know what, I think I wanna give it a try,” but I got her set up one day at Christmas, and she’s been using it ever since. Industry is not only taking notice, but they’re starting to act. One of the companies actually released a closed loop system that they had been working on for some time, but it’s a very siloed system. It works with their insulin pump with their CGM and it’s also a very conservative system. You can’t do it from your cell phone. It has very stringent limits on where you can even set your set point and it has a lot of alarms. It requires a lot of attention. But at the same time, Dexcom went and hired me, they said, “You from the community, we want you.” They actually hired Ben West, who is the one who worked all that time on doing the protocol packing. 19:53 CH: Before I even got to Dexcom, a couple of companies had me come in and do a little bit of consulting, to say, “Hey we’d seen these movements happening. Can you tell us, what is it, how can we look to that and improve our products either using the software that exists or using the ethos of it? Just last year JDRF which used to be the Juvenile Diabetes Research Foundation, they actually put out a request for proposals for companies to start doing open protocol systems. How can you open up your protocol and make it available so that they can be interoperable, so that this CGM can work with that insulin pump. And companies are starting to get involved with that now, and I think it’s showing a turning of a tide where the difference between these citizen hackers and all these DIY tinkerers and the products that will be available in the mass market that more people can access, that line is starting to blur a little bit. And so it’s quite exciting to see it. Now I’m on the inside but I feel like from the inside, I’ve been able to help influence that as well. We still have all these groups on the outside who are working on it and I get to kind of nudge a little bit. 20:58 ST: Alright, I have a final question I always ask everyone which is the show is called Do Good, Be good, so what does it mean to you to be good? 21:06 CH: I think it probably mostly revolves around being honest both with yourself and with the people around you. I think when you get to a state where you’re constantly needing to justify things or contradict yourself especially telling yourself lies to keep you going at something, it probably means that you’re not doing good, it probably means that the motivations that you have for doing whatever it is that you’re doing aren’t really good in and of themselves. 21:38 ST: I’m so glad I could introduce you to my friend Chris. Thank you Chris for coming on the show. Next week, our guest is Jessica Pettitt. Jessica is a professional speaker, author, and a great story teller. We’ll learn about her concept of good enough now, or as she explains it, it’s how we can do the best we can with what we have some of the time instead of striving for perfection or just opting out entirely. To subscribe to the podcast so that you get each episode as soon as it is released search for Do Good, Be Good, in Apple podcast, Stitcher, Google Music or your podcast purveyor of choice. And thanks as always to our host Sun Sounds of Arizona and a shout out to our editor Bob Larkin. Music in this episode is bathed in fine dust by Andy G Cohen released under Creative Commons Attribution international license and discovered in the free music archive. Until next week this is Sharon Tewksbury-Bloom signing off. Very good interview with Cris, congratulations. I only got to know about Loop, DIY, and these other groups very recently (Sept 2108). I am glad I did hear about these great people. I have diabetes for 52 years now, and I have been waiting for a cure since then. But no cure whatsoever in the near future, so I started working on an interface and algorithms to ease my life and I expect to make them available to other pump users. I am so glad you enjoyed the episode. Thank you for listening and for sharing your own experience!